Sorry the picture is a little fuzzy (hehehe…just like the subjects of the picture) but I just had to give you a doggie update. If you are new to my blog, I lost my sweet Gypsy back in October. Bandit (the black and white dog in this picture) went into a deep depression and we were so concerned about losing him that by the next weekend we had adopted another dog…the brown ball of fuzz you see (Coco). Both Bandit and Coco came from the same rescue organization (Luv4K9s) and you would think they have been together FOREVER they way the get along and play together. 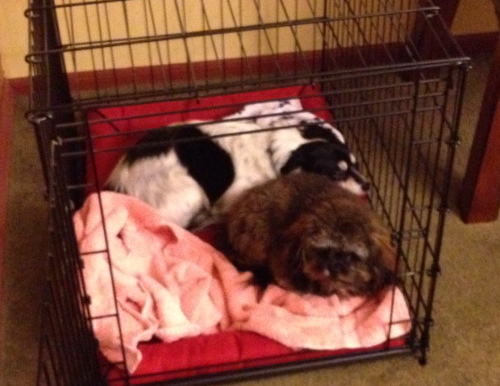 The newest thing Coco (brown doggie) does is go into Bandit’s crate and cuddle with him. Today it is very cold and snowy in Xenia (school was canceled because of the weather) and this is how I found the little doggies most of the day! Bandit is tolerating this invasion of his space really well….but then he was ALWAYS snuggling up to Gypsy! So for those of you who were wondering how the little puppies have been getting along…I think this picture truly is worth a 1000 words! So hope everyone who is in the area effected by this winter storm is staying warm and dry! I am soooo happy that I didn’t have to go out in it! This entry was posted in Personal and tagged Puppies. Bookmark the permalink. They look so comfy and I’m sure appreciate having a forever home with you! Thanks for the update. We have also adopted from our Humane Society and have been so blessed with our two companions. Oh my goodness, I am so proud of them. Give them a big HUG from Auntie Karen.